These are great, you create those books so well. Fantastic. Hi all, My name is Nicola, After school i went to college to study Childcare, i love working with children, its such a rewarding and fun job, i get to go to work and play with toys all day with a lot of hard work thrown in lol,I think its the best job in the world unfortunately im having to take some time off due to ill health but hope to get back soon, But having time off have given me more time to craft. I have been making cards for about 4 years and have been cross stitching for around 16, though card making takes up all my time now, my main love being decoupage, stamping and CD's. I also love to make little things for the home like decorating candles, boxes and using card making materials to make pictures to hand on the walls, in fact me and my mum are now fighting for wall space as she has walls full cross stich too, anyone who vists could be mistaken for thinking there were in an art gallery lol. 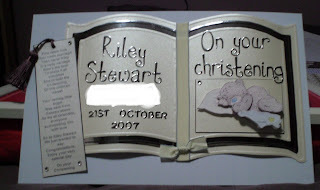 My next big project is to do a scrapbook its a bit daunting but im sure i will get there.